The story I want to tell here is a story of poor nineteenth-century cockle fishermen in the Cartmel peninsula, which was then in northern Lancashire but is now part of Cumbria. It is a story of a man called Isaac Armistead Grisdale, who was born in Allithwaite in Cartmel in 1808 and died in the same place in 1881. But before I begin with cockling let us go back a generation. Isaac was the first child of Thomas Grisdale (1784-1864) and his wife Mary Armistead, who were married in Cartmel on 30 September 1807. The Armistead family came from nearby Heversham and Mary’s father was called Isaac, hence the name which keeps reappearing in this family. Mary’s sister Margaret married Thomas’s brother Joseph in Cartmel in 1816. Isaac’s father Thomas was originally a carpenter or ‘sawyer’ who sometime after his marriage in 1807 took his wife and two children away from Cartmel all the way to the cotton weaving town of Bolton in Lancashire, where the couple had two more children: John in 1819 and William Armistead Grisdale in 1821. Whether they knew it or not they would have been surrounded in Bolton by various Grisdale relatives working in the cotton industry. But our Grisdale family here eventually moved back to Cartmel and Thomas quit carpentry and tried his hand at what was the main occupation in the area: cockle fishing, and, at times, being a fishmonger. Fishing is what he was doing in 1840 when his son Isaac married Mary Atkinson. It seems that Isaac must have worked with his father in this hard and perilous job of cockle fishing on the sands of Morecambe Bay. He continued to do so for the next thirty years, being variously described as a ‘fisherman’, ‘fishmonger’ and ‘pauper fisherman’, before turning to gardening in his old age, before his death in 1881. So these are some of the basic facts. I will return to the family later. But let’s look at what cockle fishing entailed on the Cartmel peninsula, something from which both Thomas and his son Isaac tried to make a living, but, at least some of the time, Isaac had to take ‘outdoor’ relief from the parish – hence his designation as ‘pauper fisherman’ in 1851 when he was forty-three. The Cartmel peninsular is not a very big place; all the primary villages are within a couple of miles of each other and all near the sands and sea of Morecambe Bay. At one time or another members of this Grisdale family lived in all of them: Cartmel, Cark, Allithwaite and Flookburgh. Cartmel Parish is that highly picturesque and interesting district extending from the lower reach of Windermere to the great bay of Morecambe, and projecting southward between the estuaries of the Kent and Leven, being bounded on the other sides by Westmorland. Its surface is exceedingly diversified, alternately rising into barren and rocky hills and sinking into warm and fertile valleys, whose sides are clothed with native wood. On the margin of the western sands, a peat-like incrustation has been formed, but it is rapidly disappearing under the skilful operations of the cultivator. The parish, which comprises an area of about 25,137 statute acres, is about twelve miles in length, and averages from four to five in breadth, and is divided into five chapelries and seven townships, viz. : Lower Allithwaite, Upper Allithwaite, Broughton, Cartmel-Fell, Lower Holker, Upper Holker, and Staveley, which contained, collectively, in 1841, a population of 4,924 souls. The sands between the Lancaster shore and Hesk bank, in this parish, are about ten miles in breadth, and have always been considered as dangerous in the approach from Lancaster to Furness, but in company with the guides who are stationed on them, few accidents occur. Levens sands, on the west side of the peninsula, are about three miles in breadth, and are fordable at low water, but the flowing tide from Morecambe covers the whole sandy plain twice a day, many feet deep in the liquid element. The History, Topography and Directory of Westmorland, 1851. Flookburgh was historically the main cockling town, if town we can really call it. 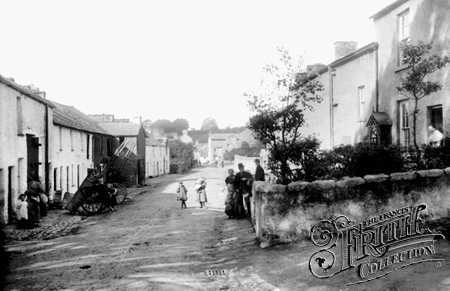 It is often stated that Flookburgh derives its name from a local flat fish, known as the Fluke, but many local people say that Flookburgh wasn’t named after the Fluke but the Fluke was named after the village. Another more persuasive suggestion it that actually the name comes from the tenth century Hiberno-Norse settlers of the area and that it means Flugga’s burgh or settlement. Flookburgh – about seven miles east of Ulverston – was, at one time, a market town of some importance, largely because it was situated on the major cross-bay route which connected Lancaster with Furness. Having been granted a charter by Edward I, later confirmed by Henry IV, and again by Charles II in 1665, Flookburgh was able to hold a market and two annual fairs. Certainly ‘fishing’ for cockles and mussels, and other fish, in the sands and shallow tidal waters of the surrounding bays must have gone on since people had first lived there. Recently one of the last true local cockle fisherman, Jack Manning, told of ‘some ancient fish traps exposed when the River Leven changed course in 2000, taking approximately 20ft depth of sand and salt marsh and exposing a rock scar where ancient fish traps were discovered. These remained visible for the next couple of years. The timbers were well preserved and a sample was sent for analysis, the result showing a date of 1350-1411 so it would seem likely that they had been placed by monks from either Cartmel Priory or Furness Abbey’. At one time the land south of the village would have been sand and, at exceptionally high tides, the sea washed over the streets. Today the sea is one mile away along a straight road over reclaimed land which leads the campus of the Lakeland Caravan Park. Cockles usually bury themselves no more than half an inch below the sand, so they become exposed as the tide recedes. But they have more to them than meets the eye – they will bury themselves deeper in the sand during heavy rain or frosty weather to protect themselves from the elements…and they may even delve deeper during a hot spell in search of a cooler place. You can often spot where there may be cockles lurking by the odd open shell where a bird has feasted or numerous depressions in the sand indicating where they are buried. Until quite recently the cockle fishermen used horses and carts, although until the estuary silted up boats would also come from further afield. The public road between Allithwaite and Flookburgh is still much frequented by drunken and disorderly men and other objectionable animals. The magistrates at Cartmel on Tuesday did nothing else but inquire into cases of this kind. Allithwaite is especially to be pitied, for its Saturday nights seem to be made hideous by inebriate men and its Sundays by stray pigs. The police and the magistrates are struggling bravely to abate both nuisances. Calm and sweet peace will presently visit the village. Near Kent Bank, resides the “Carter,” as the guide who conducts travellers over the sands of this part of Morecambe Bay, has long been designated, owing to his name being Carter. His ancestors held the same necessary office during many generations. The original yearly salary was £10, but it has been long advanced to £20, and his stipend in greatly augmented by the gratuities received from the numerous travellers, whom he conducts safely over dangerous sands and shifting channels. The guides were formerly paid by the Prior of Cartmel, but are now paid from the revenues of the Queen, as Duchess of Lancaster. The traveller, when crossing these sands on a hot summer day, is strongly reminded of an Arabian march; the tracks, or roads, are defined by branches of furze stuck in, called “brogs,” and by poles at the edges of the channels. Under the influence of clear, cloudy, or tempestuous weather, the surrounding scenery assumes an almost endless change of effect, which, combined with the refreshing sea breeze, the easiness of motion, the loquaciousness and jocularity of the guide, renders the journey extremely agreeable, especially in fine weather. “The track is from Holker Hall to Plumpton Hall, keeping Chapel Island a little to the left; and the mind of the visitor in filled with a mixture of awe and gratitude, when, in a short time after he has traversed this estuary almost dry-shod, he beholds the waters advancing into the bay, and bearing stately vessels towards the harbour of Ulverston, over the very path which he has so recently trodden.” At Kent Bank is a large and commodious inn. Given Lancastrian coastal weather (I know I was born there), it is probably pushing it a bit far to say that ‘the traveller, when crossing these sands on a hot summer day, is strongly reminded of an Arabian march’! I hope this has given you some idea of how these Grisdales lived in the nineteenth century. It was a hard life and didn’t provide much income even at the best of times. Even with the knowledge of the tides and sands, locals would often still drown when the tide came in fast. In fact Thomas’s brother Joseph was ‘found drowned’ in 1861. Returning to the family itself: when had it arrived in Cartmel and what became of it. I will be brief. Sawyer and later fisherman Thomas Grisdale (1784-1864) was the son of a weaver of Cartmel also called Thomas (1737-1807), who had married another Grisdale, Deborah Grisdale, in St Mary’s church in the county town of Lancaster in 1766. The couple had at least eight children, most of whom died young. When Thomas senior died in Headless Cross (near Flookburgh) in 1807 he gave his age as seventy. Although for some reason I can’t find his birth anywhere in or around 1737, I think Thomas senior can be no other than a son of the only Grisdale family living in Cartmel in the mid-eighteenth century: that of John Grisdale and his Heversham-born wife Elizabeth Holme. When ‘widow’ and ‘pauper’ Elizabeth Grisdale (nee Holme) died in 1792, she too was living at Headless Cross, where her putative son Thomas senior died some years later. John had died in Holme in Allithwaite in 1770. And where had John, the first Grisdale in Cartmel, come from? After their marriage in Heversham in 1825, John and Elizabeth had lived in nearby Crosthwaite and Lyth and had several children there. But they moved to Cartmel sometime prior to 1740 when their first Cartmel child, Elizabeth, was born in ‘Mineside’ in Cartmel (wherever that is). Several more children were born in Holme in Allithwaite. I’ll return at a later date to John’s origins. It’s most likely they were in Matterdale, and there seems only one possibility. Finally, what of cockle fisherman Isaac Armistead Grisdale’s descendants? This is also for a future date. But suffice it to say here that this was a very poor family indeed and many children died young. But Isaac Armistead had a son and grandson of the exact same name, Isaac Armistead Grisdale,and his great grandson, David Atkinson Grisdale (1877-1914) emigrated from Yorkshire to Humboldt, Saskatchewan in Canada in 1910, where many of his descendants still live. That’s a story I might tell at a later date. Recently came across your interesting post on Allithwaite branch of your family. I have carried out a lot of research on Allithwaite and it can be seen on Cartmel Peninsula Local History Society website. A couple of comments about places mentioned. I think Mineside is possibly a bad transcription of Mireside, a farm in Flookburgh. Holme is a farm close to Humphrey Head between Allithwaite and Flookburgh. Headless Cross is a crossroad with a couple of cottages on the edge of Cartmel where roads lead to Allithwaite, Cark, Field Broughton and Cartmel. I am intrigued that the family returned after moving away from rural life.